And just like that, the Summer is winding down. If you haven't taken advantage of the free Summer Movies in the Park you have one last chance to do so. Tonight, Thursday August 4, 2016 head to Wicker Park proper at 1425 N. Damen Avenue to catch Star Trek (2009). All movies start at dusk. A few special things will close out the movies for the season. The Wicker Park Advisory Council will be selling snow cones, you can pick up glow sticks from New City Church, sample David's Tea & Kind Snacks, sample Mini Babybel Cheese and pick up a Dunkin Donuts drink coupon. So head to the park tonight with a blanket and your popcorn to indulge in a beautiful Summer evening outdoors. You know Winter will be here before you know it. Wicker Wire: Tonight you can take advantage of a yoga class right at Lululemon's Bucktown location (1627 N. Damen Avenue) for just a $5 donation. Directly afterwards, enjoy a belly warming pizza party at Piece Pizza (1927 W. North Avenue). The one-hour yoga class will begin in-store at 7:30pm and your $5 donation benefits K9 For Keeps Dog Rescue. So not only will you enjoy a great class of yoga ... and pizza, you'll be helping a terrific rescue. Wicker Wire: The team behind Big Star and Violet Hour are working hard to open their newest eatery Dove's Luncheonette later this week. The counter service diner located adjacent to Big Star at 1545 N. Damen Avenue will be serving food morning, noon and night set to the sounds of 1960's-1970's soul and blues. You'll find Mexican-inspired soul food and a tequila and mezcal-focused bar program. There isn't an official opening date but according to owner and chef Paul Kahan, they should be open by September 22. The expanded patio is ready to go and the newly relocated take-out window (formerly located on the south end of the taqueria) is now located on the north end. Big Star reps said today they're hoping to have the new take-out area open and ready for business tomorrow, Wednesday September 17, 2014. Improv at The Den Benefits PAWS - Tonight! YOU & ME is a 2 person entirely improvised set with Michael Patrick Thornton & a guest artist, with proceeds benefitting a charity of the guest's choosing. Actors Theatre of Louisville Artistic Director Les Waters calls the show "Hilarious, horrifying, and human. Quite magical, really." Chicago Reader-Recommended. July 18: Carly Olson & ME! $5 at the door. Proceeds benefit PAWS Chicago. Cohosted by Curbside Splendor and Akashic Books, David Yow, David Sims and Mac McNeilly from THE JESUS LIZARD will be participating in a panel discussion about the band and the book, which will be moderated by Rian Murphy of Drag City Records tonight at The Empty Bottle - 1035 N. Western Avenue. The event is 21+ and is $8. Doors open at 6:30pm. You can also RSVP for free admission.The evening will also feature JOE MENO and MEGAN STIELSTRA, who will be reading new work about the Jesus Lizard, specifically written for event. 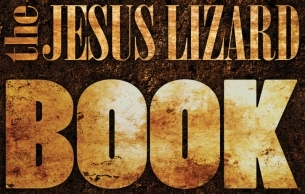 The Jesus Lizard Book is a coffee table affair of exclusive photography, art, and other imagery with written pieces by all four members of the seminal indie rock band the Jesus Lizard. The layout is stylish and elegant, particularly in contrast with the harshness of much of the band’s music. Included are many Polaroids by David Wm. Sims, a delicious recipe by David Yow, a concise list of every show the Jesus Lizard played, and writings by two producers who recorded the band—Steve Albini and Andy Gill. There is biographical material of each member that covers childhood to the demise of the group. Other contributors include, Mike Watt, Alexander Hacke, Steve Gullick, Rebecca Gates, Jeff Lane, Sasha Frere-Jones, KRK, Bernie Bahrmasel, and many more... More info at Akashic Books.